We look forward to photographing you! Clothes make the portrait, what the subjects are wearing in a portrait is just as important as all the other details such as: lighting, location, and posing. To help you with this subject we have compiled a list of what to wear tips, of course every person is an individual and if you think this is not for you then don’t worry, these tips are used daily by experienced photographers around the world, based on experience as to what looks good in camera. My goal is to help you to be the main subject in the photo and flatter you, making you look your best. For newborn and baby sessions I would recommend a long sleeve shirt for Dad in a neutral colour. Beige, khaki, light blue, olive green, burgundy, navy, charcoal, taupe, cream and brown are all great colours. Think “muted” tones. If mum can also please stick to light/neutral make-up and groom your hair in a way you want it to be remembered in years to come. Siblings should be dressed in neutral tones like dad. 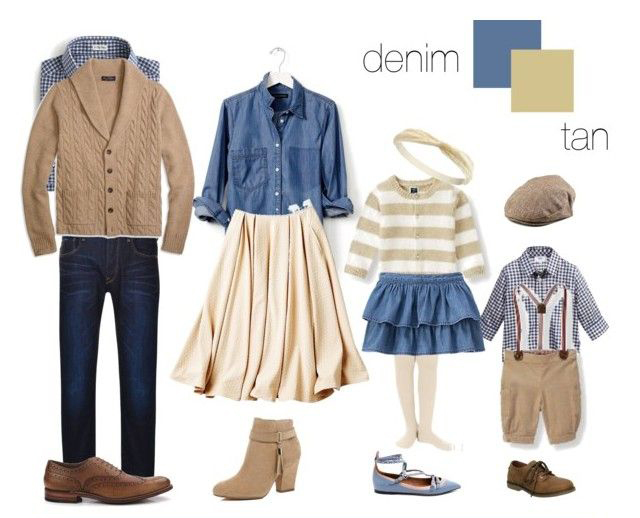 Jeans, light brown or khaki trouser work well for boys and “sundress” style looks with NO pattern look best on girls. Again, keep colours neutral and “muted” so that faces stand out more than the clothes they are wearing. Bright colours detract from your children’s beautiful expressions. • Coordinating colours not matching. Long gone are the days of everyone wearing a white shirt and matching. Instead, pick a couple of colours and choose clothes that will fit in this colour scheme. • Start with one piece and build it up. If you have a colour palette in mind, or even if you don’t…shop around to find one piece that you love. 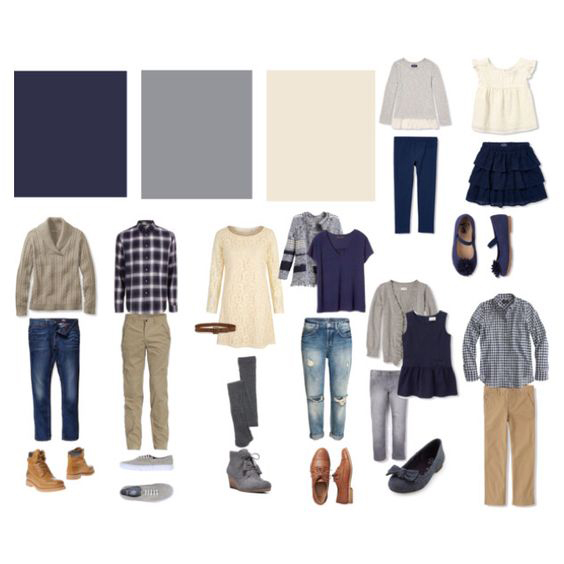 It can be a little girls neutral dress or a boy’s plain shirt, but if you find one central piece, it helps to plan and build everything around that. Since us moms like our kids to be the focal point, I’d suggest this focus piece to be on one of the children (not an adult). That doesn’t mean that they will stand out the most, after accessorizing it will all flow together. • Plan in Advance. Once you book your session, start thinking of the clothes right away. You may think certain clothes will fit your kids or that one dress is clean. If you wait until the day of or day before you may run into an issue of clothes not fitting, not coordinating or being dirty, we all have been there! The more time you allow yourself to decide what you would like everyone to wear, the calmer you will feel. • Look at your home décor advice on colours to wear, I ask where they plan to hang the portraits in their home, and what colours are in that room. For some people, this doesn’t make a difference. But for others, if they plan to hang the prints in their family room that is painted red and black, and you plan to wear orange and brown, it won’t work very well. Do you like bright colours? Neutrals? Since you will be hanging these photos in your house you want to make sure the colours of your clothes go with the colour scheme of your home. • Wear solid coloured clothing: so that we see all of your faces and no one person stands out. If you wear stripes or flowers, you will stand out from the rest of your group. • Choose muted tones: that are a bit subdued so that you are the subject not your clothes and you don’t stand out from the group. Bright colours project (especially reds, oranges, and yellows), which also makes you look larger. • Avoid all white or all black clothing: If you are wearing an all-white shirt then it is very easy to blow out parts of your shirt causing it to lose its detail. Same can be said with all black, it’s easy to have clipping on black clothing and the detail is lost. • Avoid Patterns: A little bit of texture or patterning can be a good thing in one place, but if there are multiple patterns in a photo, it can be distracting. It’s a good idea to pick 3 colours to work with as your main colours, then consider greys, whites, blacks, or browns as freebie’s. Not necessarily all of them together, but one or two that work with the 3 colours you chose. • Say no to characters: Your little one may love their Toy Story or Frozen shirt but you may want to skip it for the family photo session. Just like patterns, characters on shirts can be pretty distracting. • Comfort Matters: – kids especially – styled in hats, boots, tutus, and jackets they look adorable. But if those kids aren’t comfortable, you are in for one miserable photo shoot. Make sure to keep everyone’s comfort level in mind. • Think classic: These photos will be hanging on your walls and treasured for years to come. By choosing simple, classic clothes you will help give your images a timeless feel. Once you have gathered items in the colours you have picked, I try to find a spot in my home that I can keep it all out. I like to lay the pieces on the floor, and look at it from afar, take a picture of it, so I can see it from a different perspective. • Hair and Make Up: Stick to light/neutral make-up and groom your hair in a way you want it to be remembered in years to come. If getting a haircut or new hairdo, make your appointment at least 2 weeks prior to your portrait session – again this seems like a no brainer but you’d be surprised! Fresh haircuts rarely look their best the same or next day. Ladies need time to practice working it, men need it to grow out just a little. Allow some time to live with your new look before your portrait session. If you have natural pairs in the family: mom and dad, Brothers, sisters, Mom and baby, try to split up the colours, as they will often be standing near each other. When I have babies, I know I will want to be holding them (helps me look thinner) so I see my baby as my “pair” and aim to not dress us alike. My husband is my obvious other pair, and as the two tallest, I have to make sure he and I are also not “matchy-matchy.” This part can get complicated, so do your best, then let it go! Please check some examples on the page below! BUT, this is your session and you may want to wear certain clothes for a variety of reasons and that’s fine. What should I wear is the most common question so I put these tips together to help but by no means is it compulsory. I recommend you wear colours and clothes that YOU like as these are your photos. There are lots of helpful tips in Pinterest if you feel these colours are not your preference. At the end of this guide I have included two photos of a family I recently took, the coordinated, it gives a softer feel to the image. Thank you again for choosing Elisabeth Franco Photography to document this special time in your lives. We are honoured you chose us, and consider photographing your family a great responsibility and privilege. Thank you. Elisabeth Franco photography is located at: 28 Midsummer Walk, Hempsted, Gloucester, GL2 5EF. The cosy home studio is located in a residential area plenty of free parking is available. Elisabeth’s number is 07498721531 in case you need to call.